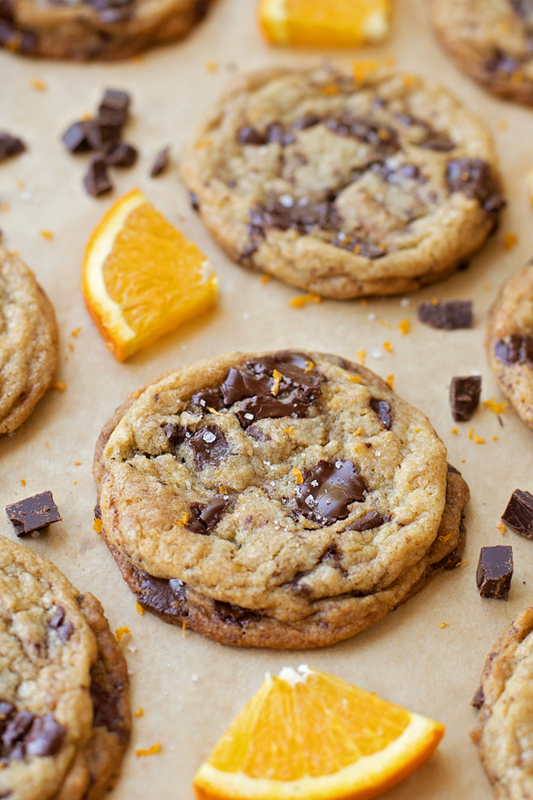 Freshly grated orange peel adds an extra hint of holiday flavor to these irresistible orange dark chocolate chunk cookies. These will disappear quickly! 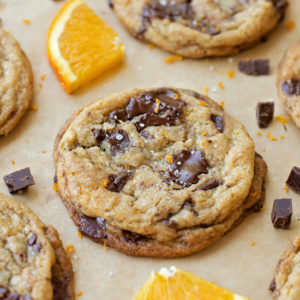 We’re kind of obsessed with orange dark chocolate bars. I’m sure if you’ve wandered down the candy aisle you’ve seen them. 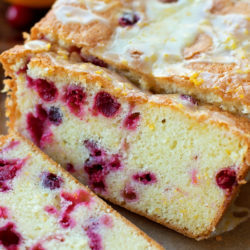 That sweet, zesty, salty combo is my weakness! Since it’s the holidays, I decided to take that combo and bake it into our favorite chocolate chip cookies. I’m never going back. You guys, these are amazing! 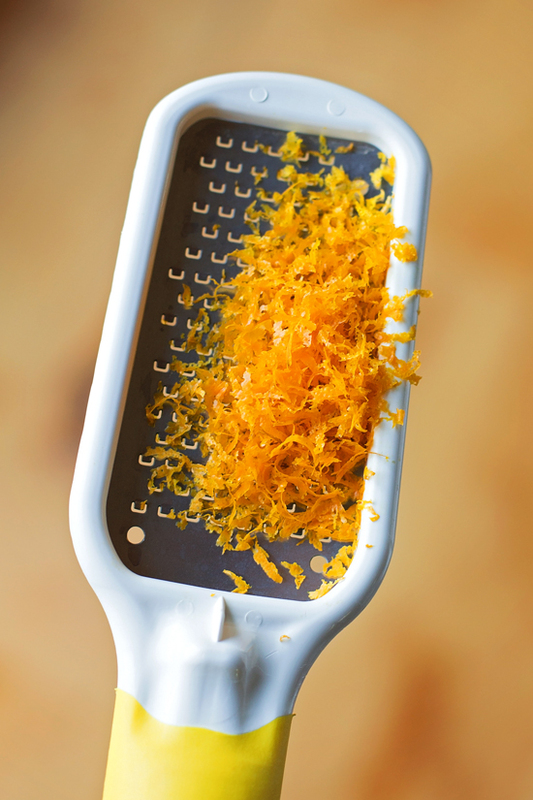 Grab an orange, you’ll need a generous tablespoon of fresh zest. Next, grab two chocolate bars and chop about 6 ounces of chocolate, I won’t judge you if you sneak in a little more. This is a safe place ????. Mix up the dough, wrap it and chill it. This is a necessary step! Because the dough has *almost* melted butter, it needs time to firm up. 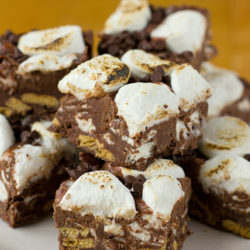 This creates a thicker, chewier cookie. When the dough is ready to be baked, grab a standard size cookie scoop and place balls of dough onto lined baking sheets. Resist the urge to create smooth balls. Craggily cookies taste sooo much better, trust me! Plus those cracks and crevices are perfect hiding places for little flakes of sea salt. Bake the cookies until they’re crisp on the edges and set in the centers, about 11-13 minutes. Once they’re cool, grab a glass of milk and enjoy! 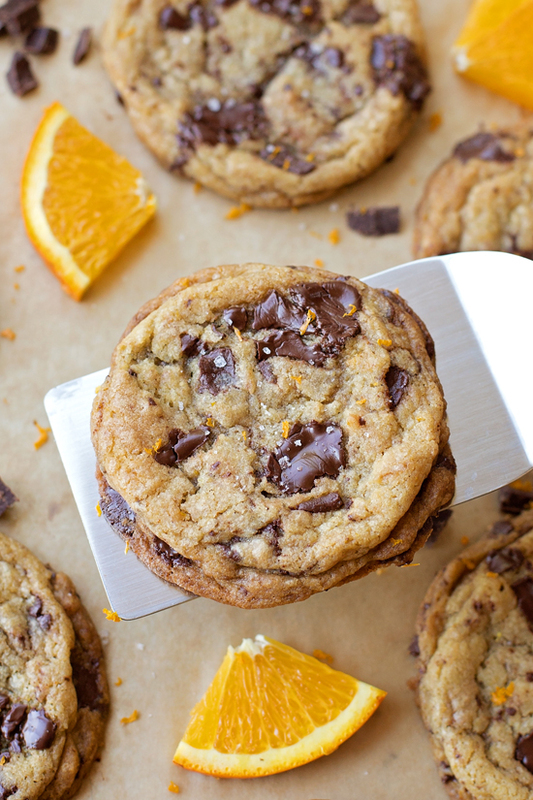 Give these orange dark chocolate chunk cookies a try, you’re going to love them! 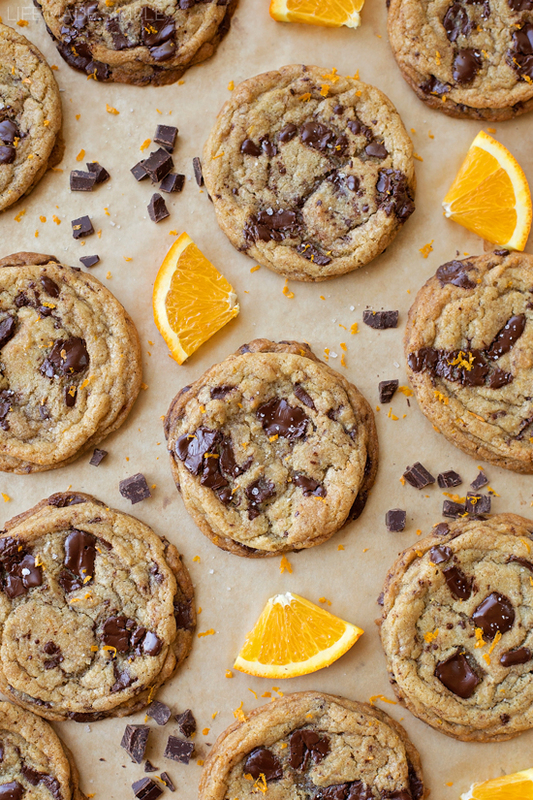 Freshly grated orange peel adds an extra hint of holiday flavor to these irresistible orange dark chocolate chunk cookies. Place butter in a microwave safe bowl and heat for 30-45 seconds (full strength) or until it's almost completely melted but has a few soft pieces left. In a large mixing bowl, whisk together flour, baking soda, cornstarch, and salt. In the bowl of a stand mixer (or a large mixing bowl with a hand mixer), beat the butter and sugars on medium speed for 1 minute. Add the zest an vanilla, beat on medium speed for an additional minute. Add the eggs, one at a time, mixing in between additions. Turn mixing speed to low and gradually add in the dry ingredients. Beat until just combined or until a soft dough forms. Fold in the chopped chocolate (and any shavings left on your cutting board) with a spatula. Cover the bowl with plastic wrap and place in the refrigerator to chill for 2 hours, or overnight. Preheat oven to 350 degrees. Line baking sheets with parchment paper or baking mats, set aside. 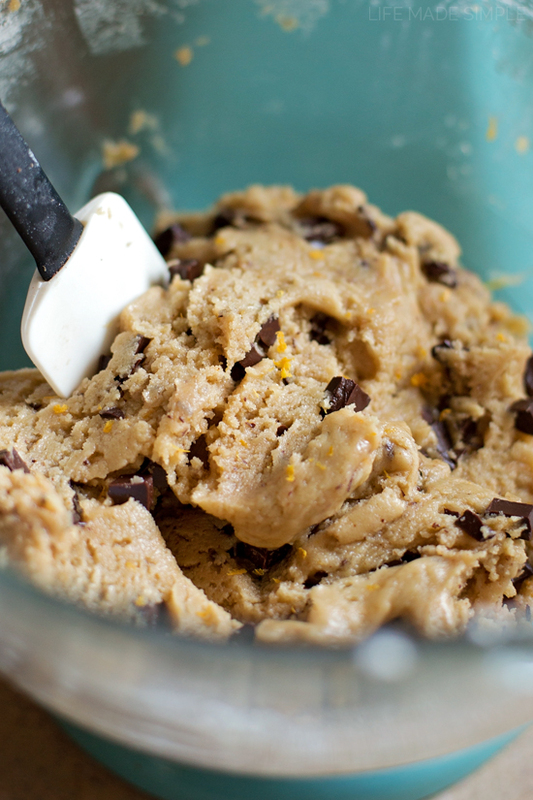 To bake the cookies, using a standard size cookie scoop (approximately 1.5 tbsp.) to form balls of dough. 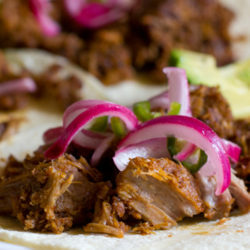 Place onto the prepared sheets, leaving at least 2 inches in between. Sprinkle with sea salt if desired. Place in the oven and bake for 11-13 minutes, rotating the sheet half way through the baking process. Remove from oven when cookies are golden brown in color around the edges. Let cookies cool on pan for 3-4 minutes, then transfer to a wire rack to cool completely. -During the holidays you can find cranberry orange dark chocolate bars, which work REALLY well in this recipe! !